A high-end translation device is essential when you want to dive into a new culture, but when you just need to get to the bathroom there are faster, less expensive ways to communicate your urgent need. The Menospeak books may sound like they were inspired by Mickey Rooney in Breakfast at Tiffany's, but they're a simple, culturally respectful way to navigate through China, Japan and Thailand  where the degree of difficulty on the language barrier is compounded by the fact that most English speakers can't even read signs. 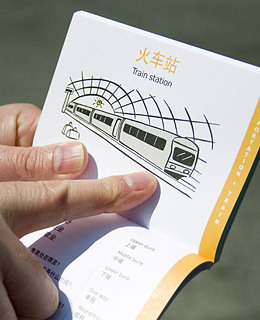 Each passport-sized book has clean illustrations and critical phrases about food, money exchange, transportation and bathrooms, printed in English and the local language, so all you need to do is open to the page and point.